Mix the cheeses in a large bowl and toss with flour. Heat the wine in a fondue pot, just until bubbling. 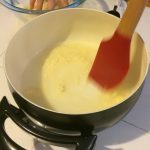 Add cheeses a small handful at a time, stirring constantly with a silicone spatula or whisk until all the cheese is melted. Serve with toasted gluten free bread, apples, carrots, sausage, shrimp, or whatever else you’d like. My mom used to take me to The Melting Pot in Nashville for special occasions. 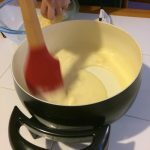 The chocolate fondue was my favorite of course, but I also loved the cheese fondue. Now I’ve figured out my own recipe. 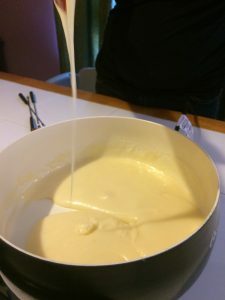 And best of all, it’s super quick and easy, just 4 ingredients, and about 5 minutes to make the actual fondue. 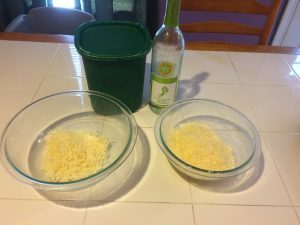 Start off with some grated Swiss and gouda or gruyere cheese, some flour, and some dry white wine. I like to use Barefoot Sovereign Blanc. 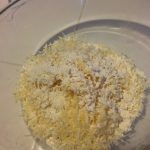 Combine your grated cheeses in a large bowl and toss with the flour. 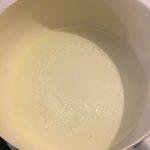 This helps thicken the fondue a little and keeps the cheese from clumping together so that it melts easier. Pour the wine in a fondue pot set at a low setting. Once the wine starts to bubble, add in the cheeses a small handful at a time, constantly stirring until all the cheese is in and melted. 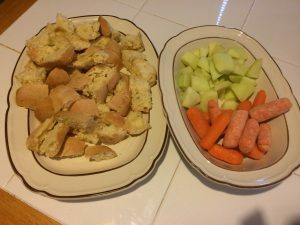 Serve with baby carrots, apples and bread cut into chunks, sausage, shrimp, or whatever else you would like. My favorite breads to use for fondue are Schär Ciabatta bread or Udi’s Fresh Baguettes. 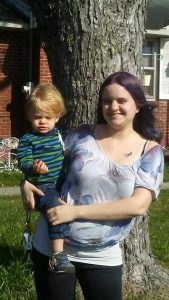 I am a young mom of a toddler boy. I love to cook. 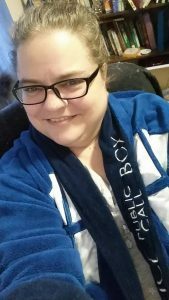 Shortly after giving birth I was diagnosed with celiac disease. My mom, who had been diagnosed a few years before helped me with the transition to a gluten free diet. Carrie is Katherine’s younger sister. 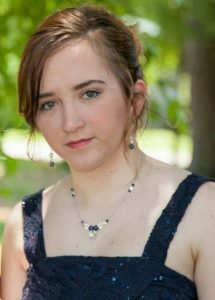 She recently moved in with Katherine, and while she doesn’t follow a strict gluten free diet, she is learning to make gluten free meals for the household. She will be contributing a few recipes and assisting Katherine with cooking and taking pictures. Cindy is Katherine’s mom. She has always loved to cook for her friends and family. She will be contributing a few recipes.